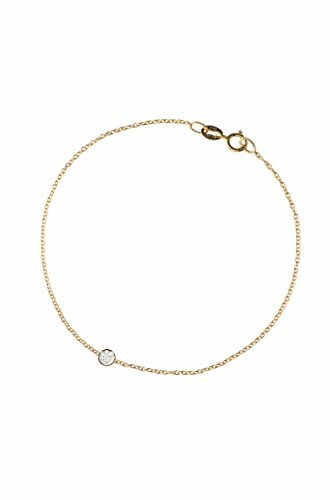 Beautifully handcrafted small diamond in a 14k solid gold small bezel cup laying on a dainty cable link chain bracelet, available in 14k yellow, white and rose gold, uber chic and timeless bracelet. Made in L.A. Weight : Approx. 1.5 Grams Carat diamond weight: Approx. 0.10 (ct. tw) Ships in 6-10 business days Note: for rush orders it ships in 4-6 business days Comes gift ready in a beautiful custom jewelry box wrapped in a satin ribbon.